This is our own special blend of organic grains. The mix includes Oats, Barley, Rye, Millet, Spelt, Spring Hard Red, Spring Hard White. This mix provides a low gluten flour when milled perfect for pancakes, muffins, anything not using yeast as the leavening agent. We use this mix for pancakes it makes the best pancakes you will ever have. The combination of grains and beans are based on the Bible Verse Ezekiel 4:9. There are always 4 specific grains and 4 specific beans in the mix. It’s this special, unique combination of 4 grains and 4 legumes that harvests benefits beyond what we normally expect from our breads, pastas, cereals, and other foods. Increased Digestibility - Fermentation breaks down starches in the grains into simple sugars so your body can digest them easily. It also increases the absorption of minerals. Great source of Fiber - Combining grains and legumes gives a good amount of natural fiber in each serving. Spring hard white wheat is a high gluten grain, just like the hard red. You can think of it like an albino hard red. There may be someone in your house hold that just doesn't like whole grain, hard white may be a way to get your loved ones eating whole grain and loving it. The most obvious difference between hard red and hard white is the color of the bran, it's lighter in color making the finished product more like processed flour. Hard white wheat has been developed from hard red wheat, according to Bob's Red Mill. Hard white has a little less protein compared to hard red, but will be fine for bread, or any yeast product. The significant difference between these two types of wheat is taste. The breeding of white wheat has given it a flavor that differs from its parent wheat. Red wheat tends to be bitter. To compensate, bakers add additional sweeteners to recipes that disguise the taste. White is less bitter in taste than the hard red wheat. Goods produced with hard white wheat require fewer sweetening agents. Ultimately, the determining factor will be preference. 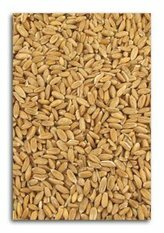 Some people will want the lighter color, milder and sweeter flavor of hard white wheat. Others may desire the firm texture associated with products made from hard red wheat. White whole-wheat also has a finer texture than red whole-wheat flour, so the finished baked goods made with this flour also have a finer texture. Hard red spring wheat -- grown mostly in North Dakota, Montana, South Dakota and Minnesota -- stands out as the aristocrat of wheat for baking bread. Hard red spring has the highest protein content of all U.S. wheats (usually 13 to 16 percent) which, in turn, corresponds with greater gluten content. The addition of hard red spring improves dough handling and mixing characteristics, and water absorption. 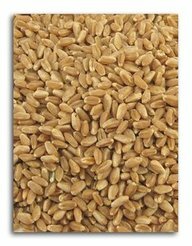 Hard red spring wheat is a specialty wheat because of its high protein content and strong gluten characteristics. Some of the world's finest yeast breads, hard rolls and bagels are made with hard red spring. There is a difference between spring hard red wheat and winter hard red wheat. The difference has to do with the time of planting. Spring hard red is planted in the spring and grows thru the summer and is harvested in the fall. Winter hard red is planted in the fall, grows until frost then is dormant throughout the winter and again grows in the early spring to be harvested late spring. The starting and stopping of the winter hard red berries causes the protein of the berry to be less, than in the spring wheat. If you are purchasing wheat berries to mill always buy the spring hard red, it's a bit more expensive but worth the extra cost for the extra nutrition. Regardless of the variety, wheat berries are high in carbohydrates and dietary fiber, as well as vitamins and minerals. Protein content varies somewhat. A normal serving of wheat berries is 1/4 cup dry which, when cooked, yields 1/2-cup serving. According to ELook.org, a 50g serving of hard red wheat berries, or about 1/4 cup uncooked, provides 163.5 calories, 1g of fat, 6.5g of protein, 35.5g of carbohydrates, 6g of dietary fiber and 1mg of sodium. Wheat berries are rich in vitamins B1 and B3; and the minerals magnesium, phosphorus, copper, manganese and selenium. B vitamins are important for a healthy nervous system and energy metabolism; magnesium along with phosphorus is essential for regulating blood pressure and building strong, healthy bones. Phosphorus is also needed to form part of DNA and RNA, activate some proteins in the body and store and transport energy. Copper is needed to form connective tissue, blood cells and promote function of the nervous, immune and cardiovascular systems. Manganese aids in bone formation and the metabolism of carbohydrates and proteins while selenium supports immune system and thyroid gland function. Wheat berries, like most whole grains, are an excellent source of dietary fiber -- which promotes digestive health; helps lower blood cholesterol and blood sugar levels; aids in weight management and encourages regular bowel movements, according to MayoClinic.com. The Harvard School of Public Health reports that whole grains, such as wheat berries, contain plant estrogens or phytoestrogens that may reduce your risk of developing certain types of cancers -- particularly in conjunction with minerals found in whole wheat -- such as magnesium, selenium, copper, and manganese. Soft white wheat is grown in the south, Arkansas produces some of the countries best soft wheat. Soft white wheat is used to make pastry flour. Whole grain flour is not just for bread, if you mill your own flour, you will want to bake cookies, cakes, pies and all of these products need a grain that will produce a tender final product. Soft white wheat does not have very enough gluten to make bread but it's ideal for cakes or other tender products.﻿ Soft white wheat berries are higher in starch which means the endosperm is larger. When the berry is milled, it's very light, silky and low in gluten perfect for tender baked products. 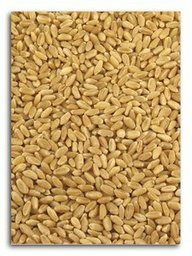 The grain has a milder taste for those who do not prefer the robust flavor of the hard wheat berries. The soft white berries have less protein and more carbohydrates. The health benefits for soft white are the same for any whole grain, the big advantage is you can make a cookie and it will have less calories than one made with all purpose flour. The reason is since the cookie is made with a whole grain, it has the bran and the germ in the flour. The bran will fill you up but go thru your system to help keep your regular. Not bad for a cookie! Spelt is an ancient grain with a modern appeal. Spelt is a member of the wheat family but is an entirely different species. It's one of the original 7 grains mentioned in the Bible. The 9000 year old grain originated in Iran and over the centuries found its way to Europe where is has remained a very popular grain for hundreds of years. The Germans call it "Dinkel" and is now found in a wide variety of foods and beverages from bread to beer; the Italians call it "Farro" and use is in pizza crust, breads and cakes. Spelt has a mild flavor and can be used in breads and many baked goods My personal experience is,if you want a lighter yeast product use Spelt as half the flour in the recipe. Spelt has a tough outer hull protecting the kernel which makes it difficult to dehull and clean the grain. It's believed that the impervious outer hull allows for the development of a more delicate, water soluble kernel. The protein or gluten found in Spelt is much more fragile than that found in wheat which makes it necessary to reduce the mix times when baking bread. Some people claim they can eat Spelt even though they're sensitive to wheat. That may be true,especially in a fermented bread like sourdough. Spelt actually has more protein than wheat, and the protein contains gluten, so it's not suitable for a gluten-free diet. If you're sensitive to wheat or other grains, you should speak to your health care provider before eating Spelt. The combination of nutrients in Spelt seems to enhance the immune system and to aid in the clotting of blood. Spelt also appears to be helpful for those who suffer from migraine headaches, atherosclerosis and diabetes. The fiber and niacin in Spelt can improve cardiovascular health and decrease the risk of heart disease, and the combination of magnesium and fiber in Spelt flour may lower the likelihood of developing type 2 diabetes. Soy flour is made from finely ground roasted soybeans. Soy flour is rich in high-quality protein as well as many vitamins and minerals. There are two kinds of soy flour. Full-fat soy flour is rich in the natural oils found in soybeans. It is an excellent source of omega-3 fats. Considerations and Use Both full-fat and defatted soy flours should be stored in the refrigerator or freezer. You cannot replace all of the wheat or enriched flour in a regular recipe with soy flour unless it is a specific recipe developed to use soy flour. In recipes for baked products that are not yeast-raised, you may substitute up to 1/4 of the total amount of flour called for in the recipe with soy flour. Soy flour adds moisture to recipes, so it may be used as a cholesterol-free egg substitute as well. Simply replace one whole egg with 1 tbsp. of soy flour mixed with 1 tbsp. of water. I carry the full-fat soy flour, it's excellent to add to baked goods like muffins, cakes anything you want a melt in your mouth feeling. Health Benefits Ounce for ounce, few foods are as high in so many vitamins and minerals as soy flour, making it an extremely nutrient-dense food. Soy flour is significantly higher in protein than whole-wheat flour, and the full-fat version contains omega-3 fats. Protein is necessary for building tissues and muscles, while omega-3 fats support cardiovascular and brain health. Soy flour is high in dietary fiber as well, which, among other benefits, promotes digestive health and may lower cholesterol. Rye is a very hardy grain, it will grow in most conditions from wet to cold and in poor soil. The Rye grass you have in your lawn is the same Rye used in making bread. White Rye is the lightest in color because it has all of the bran and germ sifted out. All that is left is the white endosperm. White Rye is higher in starch and lower in protein. Light Rye has more bran so it's darker in color but the germ is still removed.Dark Rye has the most bran hence the color. Dark Rye has the most bran hence the color. Sometimes you will see Rye labeled “Medium Rye”. This has nothing to do with grind of the flour but is a mixture of light Rye and dark Rye. Rye meal or pumpernickel flour may be whole grain flour but currently the US government has no standard for the term Rye flour. Basically if it's on the store shelf you can be sure the germ has been removed, or it's rancid since rye has a shorter shelf life then wheat at room temperature about 1 week. It's best to keep it in the freezer once it's milled. Rye is the only grain that has bran not only on the outside of the kernel but bran with in the endosperm. This is important because it effects the properties of the flour when you are using it. Since it has more bran it is slow to take up liquids, which makes the dough very stiff when you first start working with it, especially if you are using a direct dough. Rye is also has half the gluten compared to wheat so it must be mixed with a higher gluten flour like a hard red or hard white if you want a light high loaf. Rye also has a different type of protein called “pentosan”, Pentosan protein is not like gluten which are like elastic bands, pentosan is brittle when stretched which makes the rye dough very fragil to work with and difficult to achieve a high loaf. Pentosan protein also likes moisture so rye will require more liquid per cup than a hard red or hard white flour. Also when the proteins absorb the liquids they become slimy which is a different feel than a wheat dough to work with. Rye is more alkaline than wheat that is why many recipes call for a sour dough starter which balances the alkaline with acid. If the recipe does not call for a starter, many times about 1 T. per loaf of vinegar is added to the dough. Loose weight...Since it has more fiber it leaves you with a full feeling not only do you eat less but your body absorbs less calories since there is more bran and it goes right thru you. Best choice of diabetics...Your body has to work to bread down the complex carbohydrates which keeps your blood sugar more even. The glycemic index for a dark rye is 33 compared to wheat at 45 anything below 50 is what you want to target. Not only is there more bran in Rye but the bran is better for you. The bran has a chemical called lignans which lowers the PH in the colon and acts like a natural antibiotic. It is also been shown to lower cancer risks in women like breast and ovarian and benefit prostate health in men. We usually think of quinoa as a grain, but it's actually the seed of a plant. It's scientific name Chenopodium quinoa reflects, it's related to beets, chard and spinach. These amino acid-rich seeds are not only very nutritious, but also very delicious. Cooked quinoa seeds are fluffy and creamy, yet slightly crunchy. They have a delicate, somewhat nutty flavor. While the most popular type of quinoa is a transparent yellow color, other varieties feature colors such as orange, pink, red, purple or black. Although often difficult to find in the marketplace, the leaves of the quinoa plant are also edible, with a taste similar to its green-leafed relatives, spinach, chard and beets. If you're on a diet this is a must grain for you to add to your diet. Not only is quinoa high in protein, but the protein it supplies is complete protein, meaning that it includes all nine essential amino acids. Not only is quinoa's amino acid profile well balanced, making it a good choice for vegans concerned about adequate protein intake, but quinoa is especially well-endowed with the amino acid lysine, which is essential for tissue growth and repair. In addition to protein, quinoa features a host of other health-building nutrients. Because quinoa is a very good source of manganese as well as a good source of magnesium, folate, and phosphorus, this "grain" may be especially valuable for persons with migraine headaches, diabetes and atherosclerosis. Since quinoa has a low gluten content, it's one of the least allergenic "grains," but its flour needs to be combined with wheat to make a leavened baked goods. Quinoa flour can be used to make pasta, and quinoa pastas are available in many natural foods stores. 1. Measure quinoa and liquid. Place the quinoa in a very fine-mesh strainer, and rinse thoroughly with cool water. Rub and swish the quinoa with your hand while rinsing, and rinse for at least 2 minutes under the running water. Drain. Why rinse quinoa? Rinsing removes quinoa's natural coating, called saponin, which can make it taste bitter or soapy. Although boxed quinoa is often pre-rinsed, it doesn't hurt to give the seeds an additional rinse at home. Some cookbooks suggest soaking the quinoa but, in my experience, this isn't necessary. 3. Dry and toast quinoa in saucepan (optional step for a nutty flavor). Heat a drizzle of olive oil in the saucepan over medium-high heat, and add the drained quinoa. Cook, stirring, for about 1 minute, letting the water evaporate. 4. Add liquid and bring to a boil. Stir in the liquid and the salt (if using) and bring to a rolling boil. 5. Lower heat and cook covered for 15 minutes. Turn heat down to the lowest setting. Cover and cook for 15 minutes. 6. Let stand covered for 5 minutes. After 15 minutes, turn off the heat and remove the pot from the burner. Let stand for 5 minutes, covered. Combine cooked chilled quinoa with pinto beans, pumpkin seeds, scallions and coriander. Season to taste and enjoy this south-of-the-border inspired salad. Add nuts and fruits to cooked quinoa and serve as breakfast porridge. For a twist on your favorite pasta recipe, use noodles made from quinoa. Sprouted quinoa can be used in salads and sandwiches just like alfalfa sprouts. Add quinoa to your favorite vegetable soups, or stews. Ground quinoa flour can be added to cookie or muffin recipes. Kamut® is a Brand of khorasan wheat. Kamut® is a close relative to wheat whose kernel. Its about the same shape as a wheat seed but a Kamut® kernel is more than twice as big. Even though Kamut® is very closely related to wheat, many people who are wheat intolerant can eat Kamut® with no problems. Kamut® also has some pretty amazing nutritional strengths. Kamut®'s history is as interesting as any grain you can find. Stories abound about how a small sample of this grain was found in the pyramids of Egypt. They were planted and grew. This story revolves around a young Montana airman while stationed in the US Air Force in Portugal. Someone gave, or more likely, sold him 36 kernels of this grain, telling him it came from the pyramids of Egypt. Evidently, the serviceman believed him, and mailed the kernels home to his wheat-farmer dad who planted them. Of the 36 kernels, 32 of them sprouted. After carefully tending these seeds and their offspring for the next 6 years, these 32 kernels had grown to 1,500 bushels. (I did the math, yes it's possible.) This unusual, large kerneled wheat was shown at the county fair and was called "King Tut's Wheat." Bob Quinn, just a boy at the time, was a youngster in the crowd. The grain never really caught on at that time and the farmer ended up feeding it to his cattle. In 1977, Bob, now a agricultural scientist with a Ph.D., remembered that strange looking wheat and after scouring the country side came up with a pint bottle of it. By 1988, Bob had the strain built back up and had generated enough interest in it that he could start marketing it commercially. The person who sold those 36 kernels to the airman, I can only guess to make a quick buck, actually did the world a really big favor in bringing this ancient grain back from obscurity and certain extinction. Dr. Quinn patented the seed, then coined and trade marked the name "Kamut®" which is believed to be an ancient Egyptian word for wheat. Kamut® may have disappeared from it's native lands in the Old World, but it is alive and doing well in the small corners of Montana and Alberta. The fact that many people who are allergic to wheat and can tolerate Kamut® is probably the biggest reason Kamut® has made real inroads into the health food markets. Several studies have been conducted with Kamut® on people with wheat allergies. People with wheat allergies must be careful when trying Kamut®. Laboratory tests show that 30% of the subjects with wheat allergies also displayed allergies to Kamut®. In some cases their reactions to Kamut® were even worse than for wheat. However, on the flip side of the coin, many people who couldn't eat wheat had no problem with Kamut®. Giving additional hope to wheat sensitive people, bakeries have noted that their Kamut® products have been safe to eat for almost every wheat sensitive person who has purchased their products. The bottom line - if you are wheat sensitive, under the advice of your doctor, you may wish to carefully try Kamut® with the hope that you can eat bread again. If you don't have wheat allergies, you can feel confident Kamut® will be a new experience because of it's great flavor. And because of it's higher nutrition, you will probably feel better as well. Kamut® is closer to durum wheat than the hard wheat varieties and doesn't contain as much gluten. Because of this, you may wish to add wheat gluten or alter your expectations toward a little heavier loaf of bread. Kamut® goes great in cakes and is ideally suited for your home-made pastas. We think you'll appreciate the fine flavor of Kamut® and after having once tried it, will look forward to baking with this new yet ancient grain as much as your family will enjoy eating it.